King Ahasuerus is married to Vashti, whom he repudiates after she rejects his request that she ‘visit’ him during a feast, and it is Esther who is selected from all the candidates to be Ahasuerus’s new wife. As the story progresses, Ahasuerus’s prime minister Haman, without knowing that Esther is actually Jewish, plots to have the king kill all the Jews but Esther, together with her cousin Mordecai, saves the day for her people. To read The Book Of Esther click here. At the risk of endangering her own safety, Esther warns Ahasuerus of Haman’s murderous anti-Jewish plot and Haman and his sons are hanged on the fifty-cubit gallows he had originally built for cousin Mordecai, and Mordecai takes Haman’s place as prime minister. Unfortunately, Ahasuerus’ edict decreeing the murder of the Jews cannot be rescinded, so he issues another edict, allowing the Jews to take up arms and kill their enemies. This they do and it is this genocide that, ever since, is celebrated at Purim. The Judaic moral of the story is clear: If Jews want to survive, they’d better infiltrate into the corridors of power. With Esther, Mordechai and Purim in mind, Shai Masot, LFI, AIPAC and the notion of ‘Jewish power’ look like the very embodiment of a deep biblical and cultural ideology. However, there’s a twist. 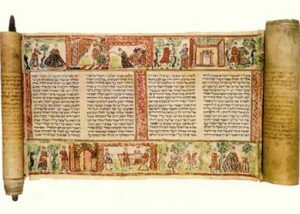 Though the story is presented as an historic tale, the historicity of the Book of Esther is largely disputed by most modern bible scholars. It is largely the lack of clear corroboration of any of the details of the story of the Book of Esther with what is known from classical sources of Persian history that has led scholars to conclude that the story is mostly, or even totally, fictional. Interestingly, the Book of Esther is one of only two books of the Bible that do not directly mention God (the other is Song of Songs). In the Book of Esther, it is the Jews who believe in themselves, in their own power, in their uniqueness, in their sophistication, in their ability to conspire, in their ability to take over kingdoms, in their ability to save themselves and in their ability to ‘take down’ Sir Alan Duncan, Jeremy Corbyn and NUS leader Malia Bouattia. The only remaining question is how long will it take before the Brits and the British government grasp what they are up against.